He is a entrepreneurial visionary and creative individual with a proven track record for getting things done. He matriculated with Georgia Military College, Liberty University, Fayetteville State University, and the United States Army Logistics Management College. He is a graduate of the Carl Vinson Institute of Government at the University of Georgia and the Andrew Young School of Policy Studies for Health Policies Certification Program at Georgia State University. He is a founding/charter member Phi Theta Kappa Honor Society at GMC and life-long member of the “Golden Key” Society. Rep. Glanton has a Doctorate of Religious Philosophy in Theology from Restoration Theological Seminary. He serves on the prestigious Appropriations, Education, Public Safety and Homeland Security, Defense & Veterans Affairs House Committees, as well as being appointed by the Governor to serve on the Joint House-Senate Committee on MARTOC (Metropolitan Atlanta Rapid Transit Oversight Committee), and the Governor’s “Blue Ribbon” Education Reform Commission. He also serves on the Appropriations Sub-Committee on K-12 Funding and Education Sub-Committee on Academic Support as well as on the Metropolitan-Atlanta Regional Transit Solutions Committee. He was appointed by the Speaker of the Georgia House of Representatives to serve on the Georgia House Study Committee on Military Installations and the Military Affairs Working Group. Glanton’s community involvement includes actively working with school committees, councils and boards, the Clayton County Grassroots Leadership Institute, the Clayton County System of Care (CCSOC) and Clayton County Economic Development initiatives. He serves as host of several major community events including the Southside Music Festival, National Day of Prayer, International Cultural Celebration and the annual Prayer Breakfast just to name a few. Rep. Glanton is a licensed and ordained minister. He is the President of the Clayton County Ministers’ Conference and co-founder of the Coalition of Clayton County Clergy. He is a United States Army Retired War Veteran. Rep. Glanton is a recipient of the Federal Humanitarian Service Medal, the Kuwait Liberation Medal, and the Georgia Secretary of State’s Outstanding Citizen Award. He is Clayton County Arc’s 2008 “Legislator of the Year”. He is the Clayton County Chamber of Commerce “Community Service Award” recipient for 2008; was selected to the Georgia Chamber of Commerce 2009 “Honor Roll; received an A+ ranking from the Georgia Chamber for the 2013 Legislative Session, and also received an A+ rating from the Georgia Parents Alliance for his efforts in the field of Education. Glanton is a charter member of the Lions Club International, (Clayton County) Jonesboro Chapter. He is a 2017 Henry Toll Fellow Graduate, and in 2017 he was honored as the Clayton County Chamber of Commerce Women in Business Council’s “Man of Distinction”. As a result of his State and National Leadership and Service, he was commissioned into the Honorable Order of Kentucky Colonels as a Colonel and Ambassador of “good will and fellowship” by the Governor of Kentucky, the Honorable Matthew G. Bevin. He served as Chairman of the nine-member Clayton County Legislative Delegation from December 2009 through January 2011, and also served as its Secretary during the 2007-2008 legislative sessions. He was first elected to the Georgia House of Representatives in July 2006. During his tenure in the House of Representatives, he introduced and passed significant revenue generating legislation for the Cities of Jonesboro, Forest Park, Riverdale and Morrow and Clayton County totaling over 1.5 Billion dollars in potential revenue and development. He has personally risen over $400,000 dollars in donations for local nonprofits. He is credited with passing Ethics Legislation (HB 1302/743) for the Clayton County School Board in efforts to regain the System’s Accreditation. He is a charter/founding member of Elite Scholars Academy Charter School , a 2012 Georgia School of Excellence and 2014 National Blue Ribbon Designated School and served as Chairman of the Governance Board for the school. Rep. Glanton also served as the Chairman of the Clayton County Ethics Commission appointed by the Board of Commissioners to rewrite the County Code of Ethics in 2008. Rep. Glanton is the 2014 author of House Bill 1009. HB 1009 is legislation that authorizes Clayton County after forty-two (42) years to join Marta and re-establish public transportation in Clayton County. Rep. Mike Glanton is a 2012 nominee for the Association of County Commissioners of Georgia Leadership Award for Leadership Development Advocate of the Year. He is a 2011 recipient of the Gospel Choice Awards “Oscar” for the Top Ten “Chosen” Pastors in Georgia. He is 2014 Nu Purpose Community NU Vision Service Award recipient and 2014 20th Anniversary Gospel Choice Awards 100 “most Influential Pastors”. He is a member of the Southern Poverty Law Center. Rep. Glanton serves as the Chief Executive Officer (CEO) of a International Consulting Corporation. He was recognized in the fall 2011 edition of the Atlanta Business Journal as one of the 50 “Most Powerful” African Americans in Business in Georgia. In January 2014, Rep. Glanton was appointed to Georgia Governor’s prestigious Severe Winter Weather Warning and Preparedness Task Force and was appointed by the Speaker of the House to serve on the House of Representatives study committee on the “Role of the Federal Government in Education in Georgia and Common Core”. He was nominated and selected to receive a “Living Legends” Award from the Forest Park Ministers Association and Community Service Award from Divine Faith Ministries International in 2016. 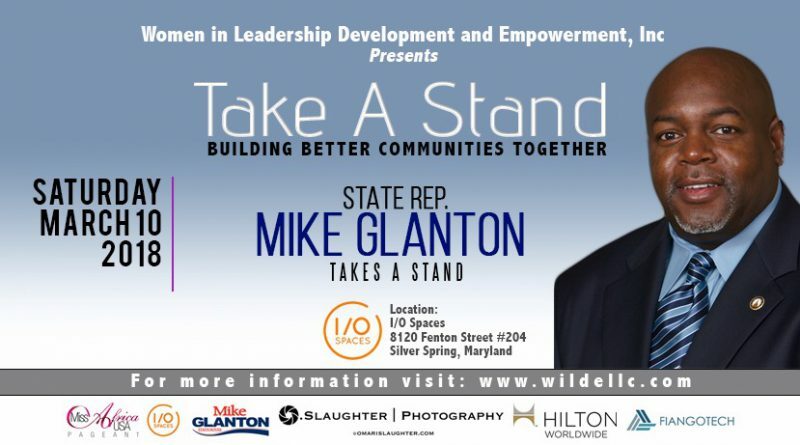 “I commend Linda Arrey and her team for their global vision and development of the “Take a Stand” Campaign and Conference. 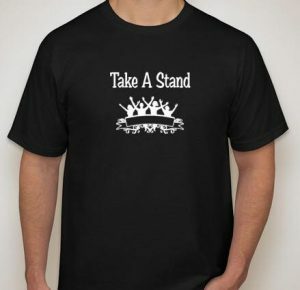 I support the “Take A Stand” Campaign because It is incumbent of all of us, men and women around the world to work together collaboratively to eradicate our societies of the heinous senseless violence running rampant in our streets and communities often times perpetrated by our youngest citizens. We must be societies of respect, tolerance, diversity, honor and inclusion; understanding that while we may be different in color, gender, religious beliefs, socioeconomics, customs, traditions and philosophies, we all have an inherited obligation to live in relative peace and tranquility co-existing without abuse, violence, harassment and discrimination. I encourage my colleagues and leaders around the world to get involved and support this laudable effort. We MUST all “Take A Stand”. He resides in Jonesboro with his lovely wife Pearla (Kauai, Hawaii). He is the proud father of five adult children, grandfather of seventeen and great grandfather of two (twins). Communities of Jonesboro, Morrow, Lake Spivey, Flint River, Irongate, Mundy’s Mill, Lovejoy, Riverdale, & Point South.